Replacement sun lounger covers are available from different manufacturers as they are essential for the protection of loungers that are often expensive in nature. If you would like top preserve the quality of your sun loungers and make them durable enough so they last you for a long time then you would definitely want to get all relevant accessories that are associated with it. From sun lounger cushions to sun lounger covers and other maintenance products depending on the type of lounger that you may have invested in, you will require everything in order to have the best from your outdoor furniture. It goes without saying however, that you need to pick your sun lounger covers carefully as you would require a sun sun lounger cover that would not only fit well but also cover your sun loungers in their entirety. The type of weather that you would regularly be exposing your loungers to, should determine the exact material type you should be opting for when it comes to these covers. While its ideal to purchase your sun loungers and their matching covers together, this may not always be possible or practical which makes it even more important for you to know well about about sunloungers when shopping for covers for them. 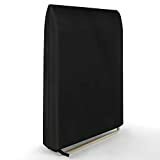 Durable Material - Made of 420D oxford fabric which is weather-resistant, dust-proof, this sunbed cover can protect your furniture from the elements of forces, such as wind, sand storms sun and rain etc. Rip Resistant and UV Protection - Made of amazing high quality material and bound edges give full protection for the cover from cracking. UV resistant design provides exceptional durability to sunlight. Wind Resistant - There is a Velcro Side-Strap and one Click-Close Straps on sunbed cover. 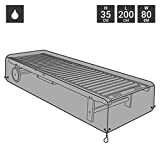 Which was special designed to keep sunbed cover secure on the sunbed, so that the sunbed cover will not be blown away by wind. Wide Compatibility - L200cm x D75cm x H40cm (front) - 70cm (back). Check your furniture and equipment dimensions for proper fit. This cover fits different styles and brands sun lounger, sunbed. 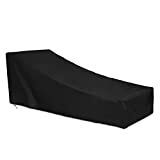 Outdoor Sunlounger Cover: This garden sunbed cover measures: 82" Lx30" Wx16"/31" H (210x75x40/80cm), suitable for most sunbeds. Protective Outdoor Sunbed Cover: Cover is made of durable polyester fabric with PVC coating which can support water resistant, rip resistant, anti-UV, fade resistant, dust-proof, protect your sunbed from snow, frost, dust and sun. 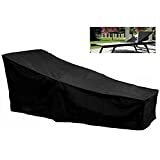 Secure Fit and Wind Resistant: Black sunbed cover has drawstring at bottom can help tighten and prevent the cover from being blown off. Easy to Clean: Sunlounger cover is easy to use and clean. Simply hose with water and dry it in the sun or wipe with a damp cloth. It comes with a storage bag for storing when not in use. "It comes with a storage bag for storing when not in use. " Features: Aluminium eyelets with PP cord around the base for extra security, easy wipe waterproof finish and heavy duty. Please note: only cover included. Durable Material - Made of waterproof oxford fabric which is weather-resistant, dust-proof, this garden chair cover can protect your furniture from the elements of forces, such as wind, sand storms sun and rain etc. 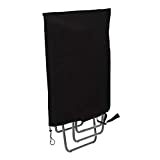 Wind Resistant - There is an Adjustable Hem Cord and two Click-Close Straps on folding chair cover. Which was special designed to keep folding chair cover secure on the chair, so that the folding chair cover will not be blown away by wind. Wide Compatibility - 93x82cm(LXW). Check your furniture and equipment dimensions for proper fit. 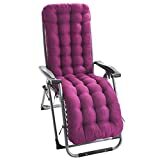 This cover fits different styles and brands folding reclining chair, folding sun lounger, folding sunbed. 【Suitable Size】The size of our chair cover is 107 x 90 cm. Suitable for XL Lafuma and Sungörl loungers or other types of collapsible relaxation lounger. Check your furniture and equipment dimensions for proper fit. 【Wind Resistant】Equipped with elasticated hem and click-close straps to secure our cover tightly sleeved on the furniture in windy days. Your furniture will be kept in great conditions through all seasons! 【Durable & Rip Resistant】Made of high quality oxford polyester 420D. The optimal structure and quality of the material guarantees a high degree of flexibility combined and high load capacity. Equipped with a zippered storage bag for easy storage. 【Versatile protection】Waterproof design helps protect against damage caused by wind, rain, snow, UV rays, dirt, dust, moisture & more. Heavy-duty strength and durability will give your chairs many years protection. 【Satisfaction Guarantee】Whatever problems of the product, please feel free to contact us. Moonkit promise a 12 Months Warranty and 45 Days Money Back Guarantee. 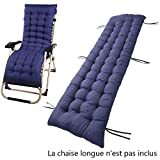 Made of durable polyester fabric with PVC lining, which protects your sunlounger from rain, dust, wind, sun, leaves, bird droppings, insects, etc (except in extreme weather conditions). 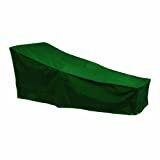 Outdoor Sunlounger Cover: This garden sunbed cover measures: 208x79x41/76cm , suitable for most sunbeds. Easy to Clean: Sunlounger cover is easy to use and clean. Simply hose with water and dry it in the sun or wipe with a damp cloth.It comes with a storage bag for storing when not in use. It is difficult to imagine investing in a sun lounger without considering going for sun lounger covers at the same time. So what are some of the main advantages of sun lounger covers? Protects Your Loungers: By investing is an appropriate sun lounger cover, you will basically be protecting the surface as well as the entire sun lounger from harsh weather conditions. Be it direct exposure to extreme sun light, heavy rain, dirt etc, decent quality sun sunlounger covers would offer you sufficient protection from them all. Restrict Usage: When you leave your sun loungers open, they can be put to unnecessary use by just about anyone who can find access to them and this may not work too well for everyone. So, one of the reasons some sun lounger owners go for replacement sun lounger covers or sunbed covers is so that they can restrict usage of their favorite sunbathing furniture. Aesthetic appeal: Good quality sun lounger covers can make your loungers look good even when out of use as opposed to gathering dust and looking weird for one reason or another when stored without use. Safety and Cleanliness: Sun lounger covers can keep your loungers clean and tidy thereby protecting you against bugs, insects etc that could find their way into holes that they could dig holes on your loungers and cause you heath problems later on. The importance of buying replacement sun lounger covers from the right stores cannot be overstated. This is because you will not only want to identify the right covers that would perfectly fit your lounger or sun beds, but also you will want to have a seamless buying experience. 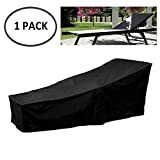 Amazon being one of the best sources of replacement sun lounger covers, you get access to the biggest possible variety from multiple vendors eradicating the need to have to look elsewhere.